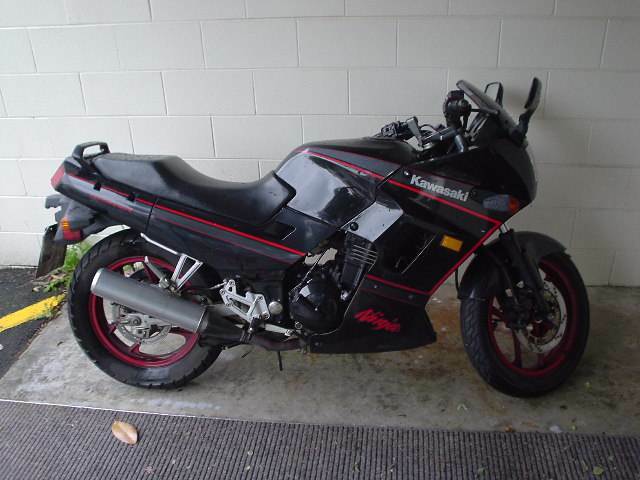 For the six months leading up to February of 2002 I constantly tormented my friends, family and flatmate (who also qualifies as a friend the lucky devil) about buying myself a motorbike. I bought every available bike magazine published in NZ as soon as they appeared on the shelf of whatever shop I happened to be in and spent most of the 6 months drooling over 750cc+ sports bikes until a friend of mine finally hauled me back down to reality. Dean, you dont actually have a motorbike license do you. After being away on holiday in September I came home to find the cover that had been on my bike had blown off and there'd been some heavy rain in my absence and the bike wouldnt start. After finally getting it running the story only got worse. After re-fitting the tank and filling it up I noticed a petrol leak. Read about the repair job. Since buying the bike in February I'd thought about very little other than which bike to buy next and in December I finally got my arse into gear and bought a Ducati 600SS.